Researchers at Nagoya University have identified the series of molecules involved in the regeneration of damaged nerves in roundworm, showing that it largely overlaps with the signals used by the intrinsic removal system to take up and process dying cells. Nagoya, Japan – The branches of nerve cells called axons are particularly susceptible to damage due to the long distances they extend to communicate with each other. In humans, such damage in peripheral regions of the body can be relatively well repaired, but this repair is less effective in the brain and the spinal cord, which helps to explain why conditions such as brain and spinal cord injuries are so debilitating. In a new paper published in the journal Nature Communications, researchers at Nagoya University have made a major advancement in characterizing how axons regenerate by studying the roundworm Caenorhabditis elegans, a species that is widely used in biological research and has a very well-characterized nervous system. 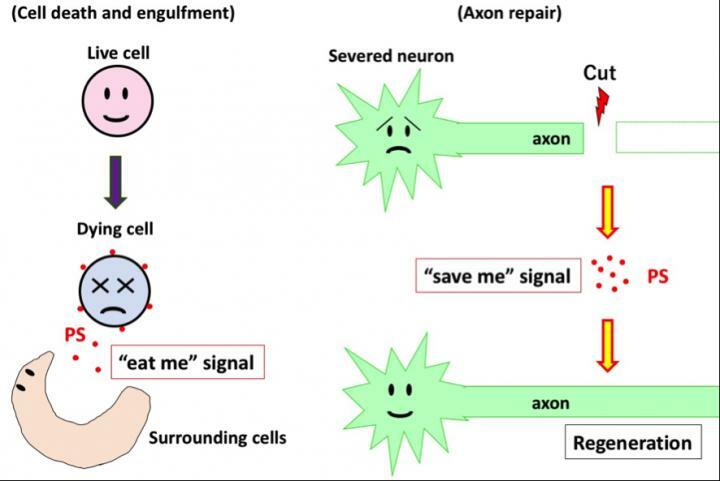 Specifically, they have shown that axon repair occurs using largely the same set of molecules that mediate the recognition and engulfment of apoptotic (dying) cells by the surrounding cells. The result suggests that this system has been co-opted for an additional purpose over the course of evolution. The team used a laser to cut roundworm axons and then analyzed the subsequent series of molecular reactions that occurred. They found that this damage resulted in the movement of a lipid called phosphatidylserine (PS) from the inside of cells to their outside, which was mediated by a protein called an ABC transporter. This externalized PS was then recognized by another molecule, triggering a series of reactions that eventually led to repair of the axon. Interestingly, PS is better known as an "eat me" signal that helps the phagocytosis of a dying cell by its neighbors. "We were able to dissect the complex range of molecules involved in axon repair by using fluorescent labels in and around the severed axon and knocking down the individual components suspected of being involved," says corresponding author Kunihiro Matsumoto. "Although many of these molecules are also active in promoting phagocytosis of apoptotic cells, in axon repair that creates a 'save me' signal rather than an 'eat me' one, which enables the axons to regenerate." According to Naoki Hisamoto, "Now that we know how this system works in the relatively simple roundworm, we should eventually be able to extrapolate the findings to humans. This could provide us with a range of targets for pharmaceutical interventions to treat conditions like brain and spinal cord injuries, in which the human body is not able to repair damaged nerves." The article "Phosphatidylserine exposure mediated by ABC transporter activates the integrin signaling pathway promoting axon regeneration" is published in Nature Communications at doi: 10.1038/s41467-018-05478-w.